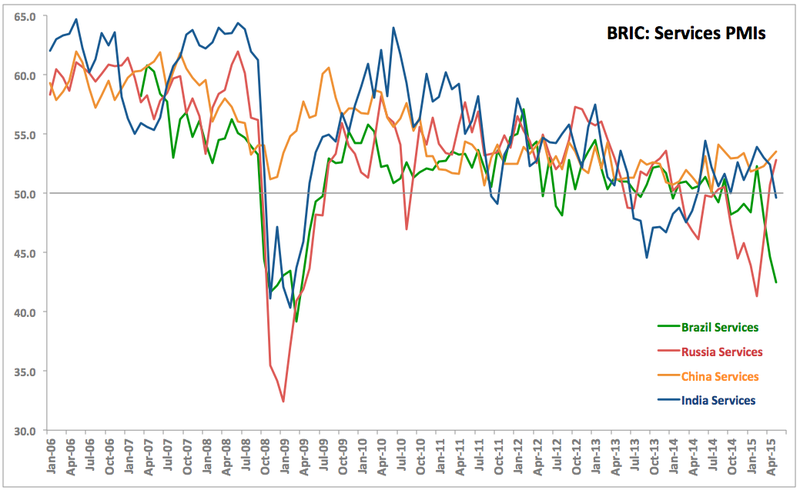 Time to tally up BRICs PMIs for May. Brazil Services PMI tanked spectacularly, falling from already strongly contractionary 44.6 in April to a 74-months low of 42.5 in May. 3mo average through May is now at an abysmal 45.0 against 3mo average through February at 49.9 and 3mo average through May 2014 of 50.7. All in, this is the third consecutive month of sub-50 readings and adjusting for statistical significance, Services PMI index rose above 50.0 only three times over the last 16 months. 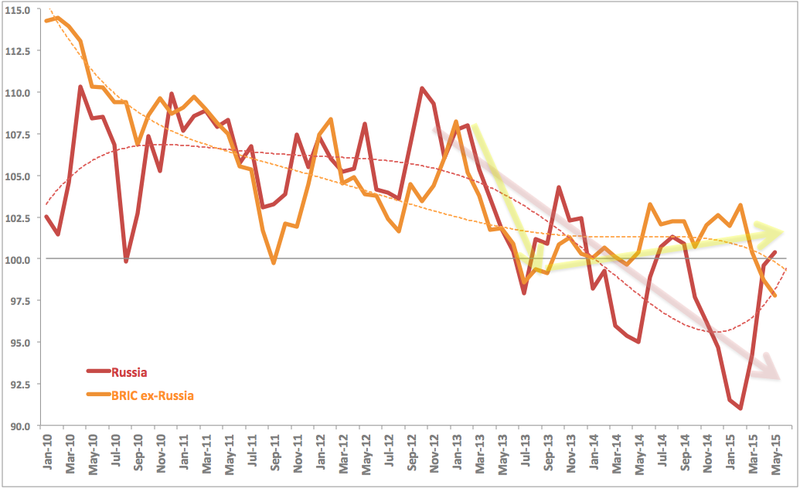 Russia Services PMI, meanwhile, surprised to the upside, rising from 50.7 in April (signalling weak growth) to 52.8 in May, signalling pretty robust recovery. 3mo average through May, however, is poor at 49.9, albeit an improvement against 3mo average through February at 43.7 and 3mo average through May 2014 of 46.9. All in, this is the second consecutive month of above-50 readings and first month of readings statically significantly above 50.0. May reading is the strongest since December 2013. China Services PMI continued to signal expansion in the sector at an accelerating rate, as the index increased from 52.9 in April to 53.5 in May. 3mo average through May is now at a relatively strong 52.9 against 3mo average through February at 52.4 and 3mo average through May 2014 of 51.3. India Services PMI tanked in May, falling from 52.4 in April to a 13-months low of 49.6 in May. 3mo average through May is now at 51.7 against 3mo average through February at 52.5 and 3mo average through May 2014 of 48.8. 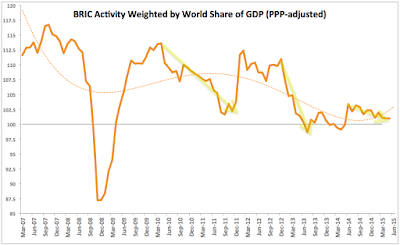 This development suggests substantial weakening in growth conditions in India which was the bright spot for growth within the BRICs group. 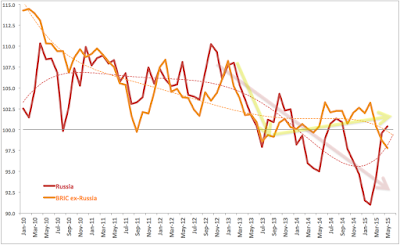 As the charts below shows, on a composite side, Russia has now reversed - for the second month running - previous trend and is now acting as a positive growth contributor to BRICs aggregates. 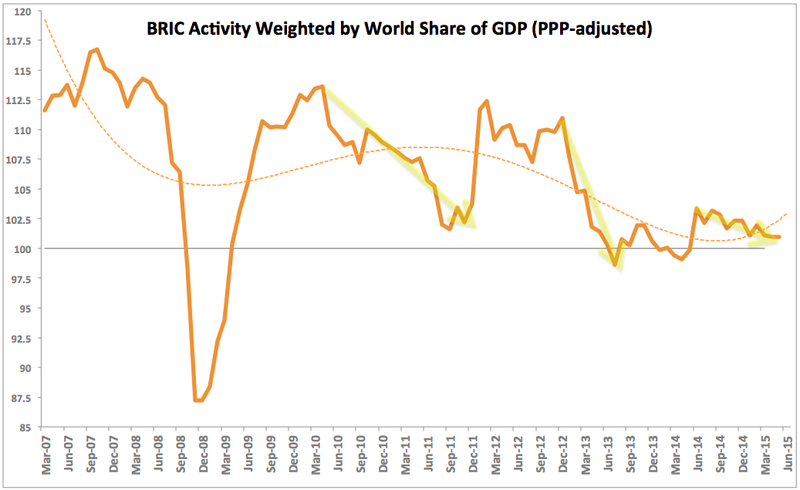 The rest of BRICs, however, are acting as a drag on growth, especially when it comes to Brazil.